When you think of shipwrecks there are a few that come to mind, such as the Bismarck or USS Arizona. But your average Joe is going immediately going to think about the Titanic. It’s easily the most famous shipwreck in the world and we all know it’s tragic story, or so we thought. For the past century, the world has been fascinated by the story of a ship that sunk tragically in the Atlantic after being struck by an iceberg taking the lives of 1,500 passengers. However, new evidence supports a claim that the Titanic wasn’t simply sunk by the iceberg but rather a fire seal its fate. It was long deemed an unsinkable ship and that an iceberg shouldn’t have been able to piece its hull. New evidence shows that one of the Titanic’s coal burners caught fire ten days before the ship set sail. This fire would have weakened the hull by up to 75% and upon impact with the iceberg sliced its side apart. The even worse fact is the ship’s crew knew about the damage, docked the Titanic to hide the markings and chose to set sail without repairs. 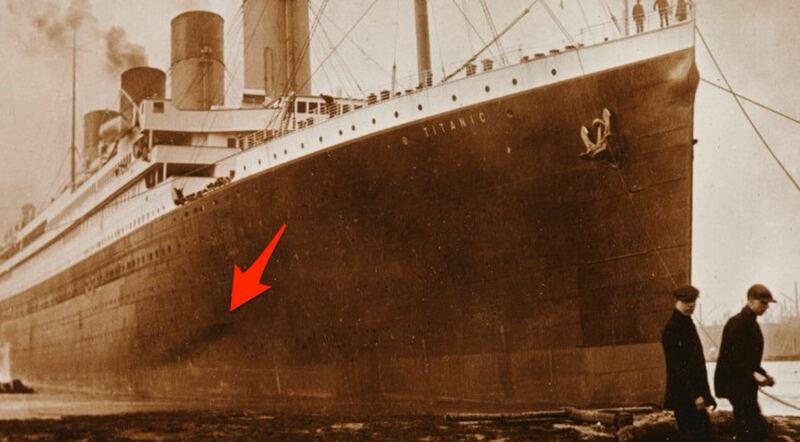 Photographs of the Titanic purchased at an auction seem to back up the claim by showing a 30-foot black marking on the side of the hull.